Home furnishing is a $70 billion dollar industry that’s growing in online popularity, thanks to the many upcoming design innovations and the convenience of eCommerce. This niche is a perfect fit for those who possess creativity with interior designs or knowledgeable in a particular home good and want to monetize from those skills without the hassle of setting up a physical business. Well, if you are one of them, then this overview about Wayfair affiliate program is a must read. Founded in 2002, Wayfair is an American company that specializes in supplying home goods, furnishing and décor items worldwide. Working with a large network of suppliers, they distribute millions of products throughout the US, Canada, UK, Germany and Ireland. The brand currently ranks third under the home and gardens online shopping category and their global popularity is clearly reflected in the growing trend as shown below. In the US, their online store gets an average of 52 million visitors per month in which 47% of the traffic derives from organic search. Free shipping, fast 2-day delivery and easy returns are known to be some of the factors that make people want to buy from Wayfair. On top of that, the company recently launches a new shopping holiday in the US called ‘Way Day’ where customers can expect offers up to 70% in discount. This implementation aims to exponentiate more sales while attracting new crowds who are looking to refresh or move into new homes. Competing with Wayfair, are a number of retailers that also have a strong eCommerce presence, such as Home Depot, lowes, Overstock and Bed Bath and Beyond. These are the brands that you can compare to when doing product reviews. Wayfair has its own YouTube channel that can benefit marketers too. If you want to create more engagement in regards to home decorating tips, for example, you may use one of their professionally made videos such as this one. Wayfair partners with ShareASale (US) and Affiliate Window (UK) to recruit affiliates for their program. Within the ShareASale merchant rank, the company is currently in the five positions which means they performed fairly good in terms of affiliate conversion. The commission rate is 7% per sale and $10 per referral if you are promoting for wedding registries. Both offers come with a 7 day cookie window. Over at the UK site, the commission ranges between 1% to 6% and it comes with a 30 day cookie window. The data feed provides well over 1 million product images and texts which can be easily linked from their catalogs to your site. When you sign up as a Wayfair affiliate, you are also entitled to promote products from their sister companies such as Joss and Main, All Modern and Birch Lane. In order to join the program, simply create a free account with the affiliate networks, according to your region and submit the application. However, do make sure that you have a functional website in place first. This preliminary step is important because the merchant needs to see that you are committed to affiliate marketing. An optimized website can provide substantial online traffic to businesses and that means, sending customers to the merchant site for a long term period. If you already have one, please skip this part. If not, the first thing to do is to find a domain name that best reflect what you intend to promote. Since home furnishing is a fairly broad niche, things can be subjected to a variety of interpretation. Hence, it’s better to target a specific audience by focusing on one or two departments so that sales can convert better. For example, a domain that says mycomfortablebed.com clearly shows that the site is about bed and possibly, mattresses. Meanwhile a domain like rustichomestyles.com is a better choice for discussing about rustic themed interior designs. A good domain name – one that’s easy to understand and remember – only cost less than $20 per year. Ideally, it should also come with privacy protection, support and email such as the one you would get at SiteDomains. After deciding on a domain name, the next step is to link it to a WordPress hosting platform (preferably one that’s easy to set up), select a WordPress theme and you are basically good to go. Content is the major ingredient for any website to thrive at affiliate marketing. It attracts online audience and helps articles to rank in the search engines. Having said that, it has to be of good quality and shouldn’t be something that you get from PLR packages or spin writing software. , Instead, it should be written with originality and targeted keywords in mind. If you look again at the merchant detail on ShareASale, you’ll find a cluster of words called the program keywords. These are basically words that are closely related to the niche and they can provide some ideas as to what type of content you want to produce. You see, when people search for something online, it always starts with a query and they are usually quite specific. People don’t typically enter single phrases like barstools or kitchen – they would type out a string of words that are known as long tail keywords. Generally, this group of words come with user intent, they are sensible and most importantly, they are not yet dominated by a lot of websites. This will give you an advantage to rank for those terms with a new niche website and start getting traffic. Finding these keywords isn’t difficult and I usually like to start my research using the Google search bar. Interestingly, Google has a way of predicting and showing relevant queries based on what people are typing. Have you seen this type of interface when searching for something? 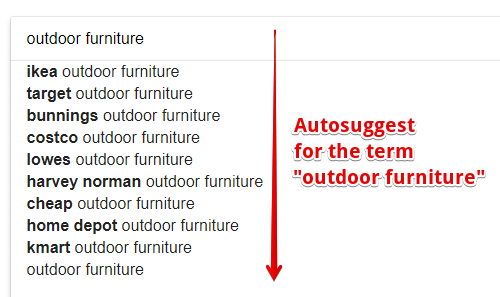 That’s what Google autosuggest looks like and it’s a valuable technique to discover some long tail keywords. The next step is to pluck the desired keywords, run it through a keyword tool and determine the competition level. If it’s non-competitive, use it to write a good quality article. If it is, don’t discard, but keep for future references. I thought it would be interesting to show you what long tail keywords look like so I’ve brainstormed those program keywords using Jaaxy, my favorite tool and came up with this random list. These are all great keywords to start writing for a home furnishing niche blog and I recommend getting about 10 to 30 keywords to prepare yourself for a month’s supply of content. Besides doing keyword research, you also need to implement the followings to make your content stands out. Write naturally in your own voice. Don’t take after all the sales copy that you read online. Be descriptive and aim for articles more than 1000 words. Optimize the SEO settings on your website using targeted keywords. You can do that with specific SEO plugins designed for WordPress platform. Create profiles on social media that you like and share contents whenever they are published. Invite readers or other bloggers within the same niche to leave comments on your blog. This doesn’t only create more engagement, but also add more content that can lead to better rankings on the search engines. When traffic starts to build up as a result of all these actions, you then have a higher chance of being accepted into the Wayfair affiliate program. This reassures the merchant that you have some level of marketing knowledge and knows what attract audiences to their product brands. What I like about this niche is that with every season, there’s always new ideas to explore. It’s a subject that’s relevant to everyone. All of us have homes and I am pretty sure we like to live in a space that’s pleasant, conducive and comfortable. Nothing is too big or too small when it comes to home furnishing. If you have some professional background, you can certainly leverage from promoting bigger ticket items like furniture or mattresses. If not, go for smaller items like decor or plants – they are just as trendy and profitable. I really like to see how you turn your unique skills into a profitable online business, so if you found some values in this article, please check out my recommended training platform to see how you can become a successful affiliate marketer. Have any thoughts or questions? Just leave your comment below and I’ll be happy to respond. I have never heard of WayFair before, surprisingly since they are such a large company and have been around for a while. This niche is really interesting because often the sales are high, leading to high commission. Also it is interesting because the sector is ever changing with each coming year, so there are new designs and ideas to promote each year. For how long Wayfair has been around, I have never heard of this place, but I have been aware of Bed Bath & Beyond and of course, The Home Depot, Lowes and Amazon. Is Wayfair a company like Amazon that is, the only interface with consumers is web-based? When does WayDay occur? How does Wayfair compare with Bed Bath & Beyond? Does it have a full line of furniture? Hi there Daniel. Great to see you again! To answer your questions – Wayfair is an online-only retailer for home furniture in the US. The headquarter is based in Boston and they have several warehouses across the country. WayDay takes place of the 25th of April and yes, they do have a full range of furniture offers. 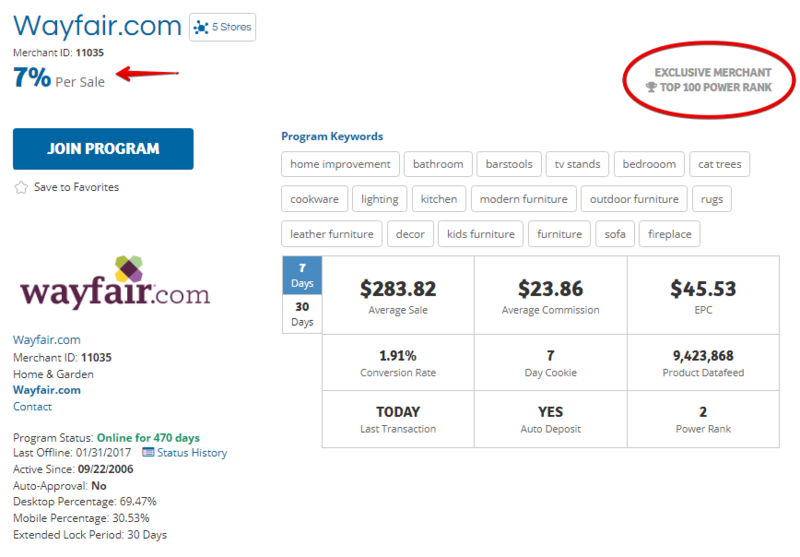 In comparison to Bed Bath & Beyond, Wayfair is actually more popular as they seem to have a higher number of visitors. You can compare both of the traffic stats using this website. Thank you for the detail that you have put into this article. You even did the keyword research which is a huge help for someone wanting to start out in this niche. You say that Wayfair sells furniture amongst other things. I just wonder how they would ship these types of products all over the world? Are the shipping charges not crippling ? Hi Michel. Wayfair doesn’t actually ship globally. Besides the US, they have sites in Canada, the UK and Germany where customers can order based on their proximity. Big furniture isn’t something people would often buy online due to shipping cost. What may work better for Wayfair affiliate marketers is to promote smaller, easy to transport items while taking advantage of their free shipping offer. I found this overview of how to monetize through the Wayfair affiliate program to be exceptionally useful. Home Decor is a particular passion of mine and as you point out is a huge industry. There are many directions in which a blogger can go under the broad home decor umbrella. A huge advantage of affiliating with Wayfair is that their breadth of offerings can support almost any related niche. Just exploring their site triggers all sorts of intriguing topic ideas. Wouldn’t you agree? Thanks for the insights!